Too Much Lead: How to - Paint damn fast! How to - Paint damn fast! I took a break from the Napoleonics, to do something quick and simple, it is always nice to get a result in double quick time, and these were old figures lying unpainted for over a decade and so in need of some love. Now, presently I've been doing a lot of fancy work, but for many game orientated hobbyists, such fancy work is unecessary; what you want is results, as fast as possible to avoid the dreaded bare metal or black undercoated army of doom. 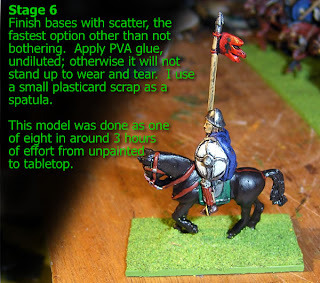 I have several armies done to this standard, including my dark ages forces. 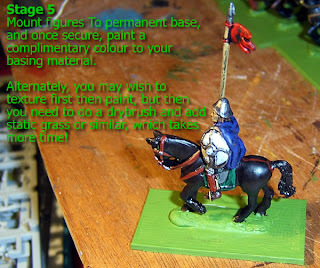 So today I'll run you through how to paint units and get them looking reasonable in a couple of hours. So the unit below is going to be represented by a single figure in the shots; but it is a force of 8 Carolingian cavalry. The first thing to say for the following techniques, is know their limits. 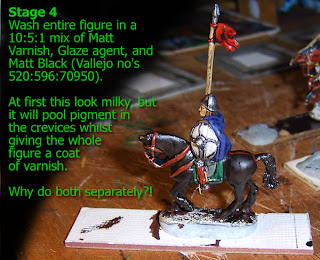 I have concluded this method, the black wash technique, works well for Medieval and earlier figures, Fantasy models and anything from WW1 onwards. I don't think it does the intervening period much justice, but it would certainly work. I'll say more on undercoating. If in doubt, go for black but consider the colours you intend painting over them. 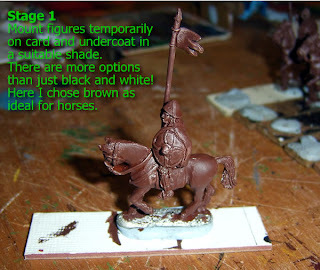 For example, if the bulk of the figure is to be finished in red or flesh, start by base coating a reddish brown; for white, start with a pale grey or very pale blue. This may mean you can't rely on a spray can, something I seldom use anyway, but it does reduce the need to apply multiple coats of paint. 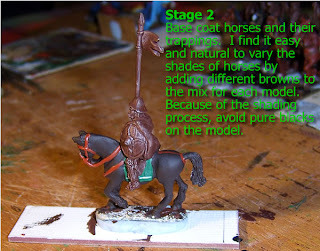 The brown here is fine for hiding missed bits in shadow, works great as a base for horses and supports the grimy, dark ages feel. 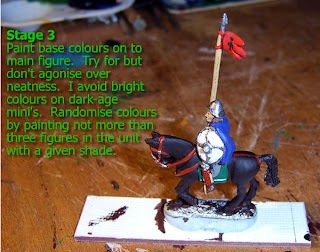 Remember, you are using black to shade, so unless you have to, avoid it as a pure colour on the models. If black is demanded I elect for a deep slate grey instead, so only the folds will become black later on. 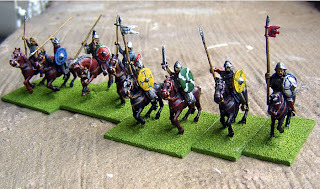 Uniformed troops are always a bit quicker to do as there is the routine of painting the same area on each one. But variation is surprisingly easy to achieve, especially with colours that should be muted and dirty looking, just keep adding a little more of a contrasting shade to your paint mix as you go. Add little details as you see fit, you don't need to go overboard to improve the appearance, a single stripe on clothing, or a shield emblem takes seconds. The key to making it faster is to plan in your head how to use your present base coat to add detail to other figures, in areas where they've already been done. Because of the effects of the shading, I suggest brighter than normal metals; these figures used Natural Steel and Gold for example. When all this is done, you should have finished models, if in flat colours, looking a little bland. Varnish plus pigment is the speed painters best friend. If you are not a proficient painter this is a great technique to hide mistakes and neaten up a messy job too. Just don't get too much pigment in the varnish; the ratio's above are the right place to start, but don't add much more black paint. Painting thinned down glue on will not do! And adding only small areas of scatter to a painted base looks bad! The textured and static grass option is nicest, but to a job of this size would've added 30 minutes to an hour. And besides, it wouldn't have matched the rest of the army. So anyway, a simple technique That means a table ready unit is only three hours work. Perhaps spread over two days, you'd hardly feel like you were doing anything! I reckon in the same time, twice as many infantry could've been completed; making it less than 15 minutes per figure. And in this case the finished result adds another 250 points to a Warhammer Ancients army.